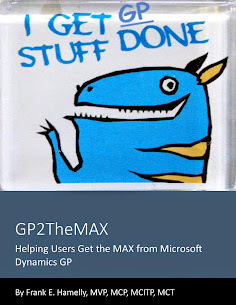 GP2TheMAX - Helping users get the 'MAX' from Dynamics GP: International Financial Reporting Standards - Are You Ready? International Financial Reporting Standards - Are You Ready? Major accounting changes are coming to the U.S. as generally accepted accounting principles (GAAP) and international financial reporting standards (IFRS) converge in the next several years. And the impact should concern more than just accountants. A change of this magnitude will impact analysis models, accounting software, and training. Companies of all sizes, but especially publicly-held companies who will see the changes first, need to understand that using a different accounting method can create different financial results and, potentially, increased tax liabilities. There are two projects going on simultaneously. The first one is the move to IFRS. The second is a draft of a new statement presentation format. The change in statement presentation format will probably happen sooner than the change to IFRS, but both of these changes demand attention because they will affect everything we do in analyzing financial statements. And if you are a Microsoft Dynamics GP customer, it will also be important to understand whether your version can support the coming IFRS requirements. The balance sheet, income statement, and cash flows each will be divided into five sections: business, discontinued operations, financing, income taxes, and equity. A fourth statement will reconcile the statements of comprehensive income and cash flows. The business section of each statement will be further divided into operating and investing assets and liabilities, income, and cash flows. Where accounts are placed will be based on where management believes they should fall. The operating section will have anything that's integral to the company's business. The investing section will include investments considered fundamental to business activities. So if you're a manufacturer, for instance, the operating section should have your labor costs, your cost of goods sold, your inventories receivable. If the company believes that its accounts receivables are investments, however, it very well could appear in the investment section. The Balance Sheet will not list total assets and liabilities. Instead, assets and liabilities will be broken out into financing and business assets and liabilities. Business numbers will be further broken out as operating and investing assets and liabilities. Rather than equalizing assets with liabilities plus equity, assets will be netted against liabilities to come up with equity. The Income Statement will disaggregate information far more than the traditional income statement today with considerably more detail on the statement of comprehensive income. Most of the work on this change in format was based on input from equity analysts and rating agencies. In the reconciliation of the statements of comprehensive income and cash flows, cash flow is going to be actual cash. When looking at this, it will give actual cash balance, actually what's happening with cash, what is in accrual, and what is a ‘fair value' change. The new format will challenge financial analysts who are more familiar with GAAP statements. Because of its disaggregation, the new financial statement format requires a lot of searching and adding things up to get what is available by just looking at GAAP statement. Under the new format, current assets and liabilities are in the operating segment, the investing segment, the financing segment, the tax segment, and the discontinued operations segment. But because there will still be interest in current cash requirements, current liabilities, and how current assets pair up with those, there will have to be some arithmetic to figure out a company's total assets and total liabilities. Besides the format differences in presenting financial information in IFRS, there will be an underlying difference in philosophy that will give management greater discretion in preparing statements. IFRS is described as being ‘principles-based'. So far, neither extensive application guidelines nor comprehensive, industry-specific guidelines exist, and there are not as many rules to follow as exist under GAAP. With the complexity of modern financial instruments, however, there is a concern about judgment. Management will need to include explanations of their judgments and analytics in footnotes, which could increase notes three- or fourfold over GAAP statements. Under GAAP, extraordinary items can be shown on the income statement. Under IFRS, that doesn't exist. Those items have to be apportioned to whatever business line they are appropriate in. LIFO accounting for inventory will not be allowed. Only FIFO or weighted-average cost will be used. There's going to be a major impact on companies with large deferred tax liabilities that have been created by LIFO accounting and how they manage the treatment of those liabilities. According to Mary Ann Lawrence, senior VP of Commercial Credit Risk Review at KeyBank, United Technologies has estimated that if it can't use LIFO accounting, it will have a $4 billion tax liability for the first year. The impact is significant. Under GAAP, fixed assets are recorded at historical cost. Under IFRS, fixed assets can be revalued. There's a lot of concern about fair valuation of fixed assets. It creates another noncash element that has to be backed out to determine if the company is actually earning money or increasing income due to the valuation of its fixed assets. Research and development are expensed under GAAP. Under IFRS, research costs are expensed but development costs are capitalized. As an example, companies in the pharmaceutical industry may see large swings in profitability because of the capitalization of their development costs. Under IFRS, goodwill and inventory can be written down and then written back up again. All of these things introduce additional noise under the financial statement, especially when it comes to cash flow analysis. Operating leases are not included in IFRS statements. Instead, you have what is called a 'right of use' of an asset. Renting a building will show up as a 'right to use your office facility.' This will allow companies to capitalize the present value of the future lease payment and show the liability on the other side as the present value of the lease payments. Using a different accounting method will create different financial results. According to industry experts, when companies on IFRS are compared with those on GAAP, on average, the earnings are 6% to 8% higher under IFRS than under GAAP. Who Will Be Affected - When and Why? The move to IFRS is a joint project between IASB (International Accounting Standards Board) and FASB (Financial Accounting Standards Board). The IASB has, for now, excluded nonprofits and private companies. They are working on a different set of accounting standards for them. FASB says it hasn't made the decision yet as to whether this change will apply to private companies or only to public companies. One timeline, published by Deloitte LLP, has U.S. public companies partially converting to the new accounting standards by 2013. The U.S. Securities and Exchange Commission has approved IFRS accounting for foreign companies listing on U.S. stock exchanges without having to reconcile to GAAP standards. EU countries, Canada, India, and Japan are ahead of the U.S. in adopting the IFRS standard. This has fueled the drive for convergence as the world's investors, businesses, and governments complain that different accounting systems are an economic cost that would prefer not to bear. The primary factor driving the movement toward IFRS is that about 100 countries are on IFRS and only one is on U.S. GAAP - the U.S. Many of the people at FASB acknowledge that IFRS will most likely be the global accounting standard moving forward. The convergence of GAAP and IFRS is likely to be costly and difficult. Analysis models, accounting software, and training will need to change to reflect the new standards. Given the impact this change could have on your organization, especially if you're publicly held, if you're not yet reviewing how the transition to IFRS from GAAP will affect your accounting and reporting system requirements, you need to be soon. The good news is, if you're already running Dynamics GP 2010, you're covered for IFRS reporting. GP 2010 introduced ‘Reporting Ledgers' that enables recording transactions in compliance with IFRS rules. If your company has not yet upgraded to GP 2010, the transition to IFRS is one more compelling reason to do so. Jivtesh Singh our latest Dynamics GP MVP! !